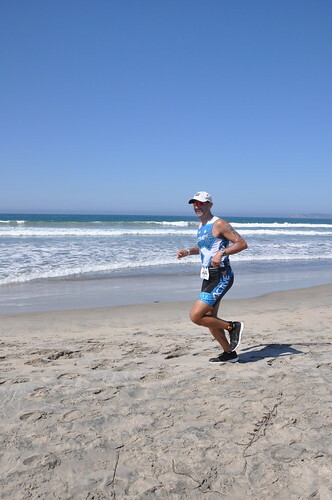 That's me finishing 34th Superfrog Triathlon, the "Original Half-Ironman". 1.2 mile swim, 56 mile bike, and 13.1 mile (half-marathon) run. It has been an almost year-long effort to get me to that finish line. Thank you to everyone who supported this effort. Most of all, thanks to Laura for granting me the time and space to do this. This race was the big, stupid thing I wanted to do to mark my 40th birthday. It took a lot of extra time and work on her part as I went on my rides and runs and I am so appreciative. 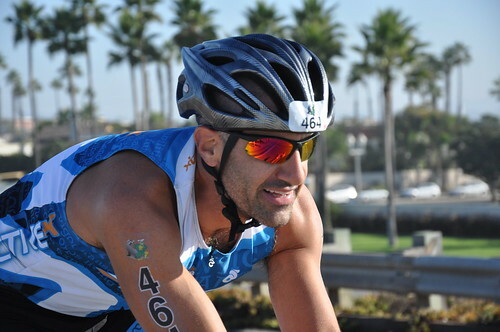 At first I was training for the inaugural ITU World Triathlon San Diego which was on May 12. My first bike commute to and from work was on January 30. Since then, I've done that commute 45 times (and am aiming for 50 for the year). I started my half-Ironman training a week after ITU on Monday, May 21. I got a training plan from TriNewbies.com and tracked everything via this Google spreadsheet. I probably averaged around 2 miles swam, 100 miles biked, and 20 miles run per week over the course of my training. So, after all that... how was the race? It started early morning on Coronado Island. 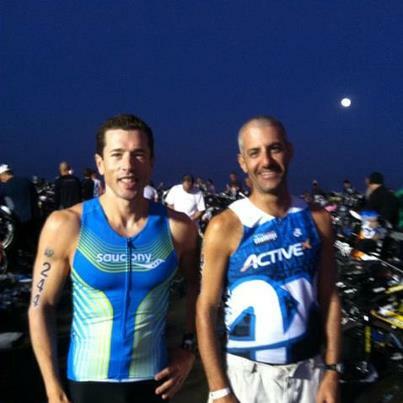 Here's me with my friend Ryan Grove in the transition area pre-race. As you can see, it's still dark and the full moon was just setting. A quick note on Ryan. Ryan's daughters have been in class with Melanie and Jenna, and our families have become friends. 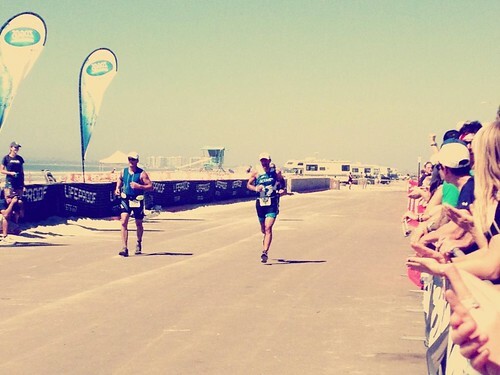 He's an amazing athlete who had never done a triathlon before Memorial Day last year. Now he's done SuperFrog twice and this year he went under 5 hours and came in third place in his age-group. An amazing acheivement. But back to the race. "The swim course is a two-loop open ocean water swim in the Pacific Ocean. Swimmers will swim out 350m, turn right (north) and swim 200m, and finally swim back to shore (350m) to begin the second lap." 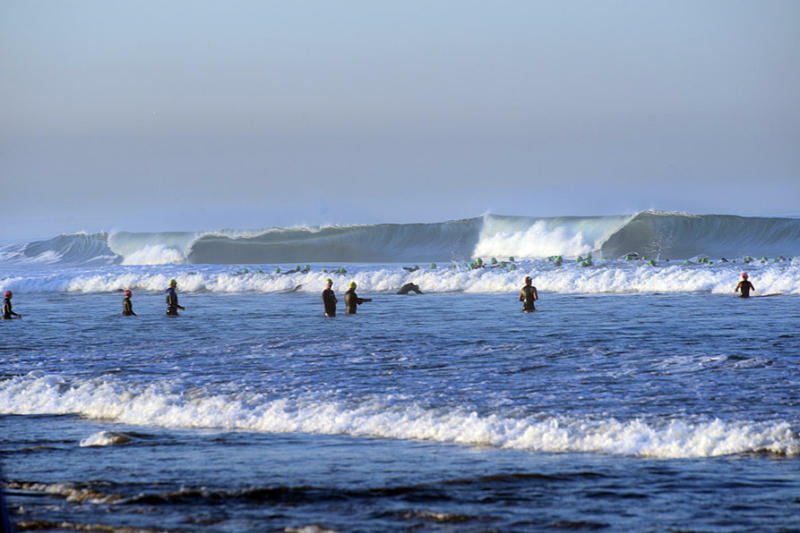 On Sunday there were big - 6-foot big - swells coming through. Here's a photo from Slowtitch.com. The green swim caps in the photo were the 30-39 year-old racers, who started 5 minutes before my wave (no pun intended). It was hard getting through the waves and panic nearly set in early. But once we were past the break, I had a pretty good swim. I did get tossed by a wave coming back in on my first loop, but otherwise I was happy with my time. I had given myself an hour to finish the swim and get out on to the bike. That was a well-padded estimate, and I was biking after 42 minutes, which I knew was pretty reasonable. "Next, the bike course is a flat and fast 56mile bike-leg consisting of four counter-clockwise 14 mile loops on Highway 75." I'd ridden Silver Strand a few time in preparation for the race, and was able to do 51 miles (3 17-mile loops) in around 3:15. On race day I was never able to get comfortable on the bike. My legs weren't cramping, per se, but I just couldn't settle into a good position or rhythm Regardless, the wind wasn't as bad as I feared and on the bike we passed a lot of great spectators cheering us on. There was one overpass on the course which I looked forward to each lap. It was the one chance to get out of the saddle and change position and cadence. And that's where a lot of the spectators were. Despite my discomfort, I hit my usual 3:15 on the bike, much to my delight. I was doing the race in my "best case" times rather than my padded, and rounded-up estimates. "Lastly, the run course is a 13.1mile course is a combination of hard-packed sand, soft sand, trails and pavement." The run was difficult. By this point in the day it was hot, and the stretches on soft sand had to be walked through. Running just wasn't any faster. I still felt good on the run. I had managed my nutrition pretty well on the bike, eating and drinking enough. I did start to get hungry on the run at about mile six, and stuffed some food down too quickly. My stomach complained and I started to walk, but a woman in an "IronMex" kit whom I'd been pacing for a few miles told me to "Vamanos!" and that got me running again. The final few miles was back on the beach and I had to alternate between running and walking. It's not that I was too tired - though I was very tired - it's that my brain was overriding my will to run. Finally, the crowds over the last half mile, and the fact that it was the last half mile, got me going again and I was able to finish strong. I did the half-marathon in 2:10, a 10 minute/mile pace that was again, my best case scenario. Overall, I couldn't me more happy. I really do feel like I accomplished something big. I was well prepared, and I am enjoying the post-race afterglow (tempered by some soreness and a few blisters). Most importantly, I am truly thankful for Laura's support, and the support of all my friends and family. It's you who have made this year, and this journey, so meaningful and so wonderful. Oh, and to answer the most common question I get asked now... No. No, I am not considering doing a full Ironman race. Sorry.